Thank you for visiting www.vitality4life.com.au! This website is owned and operated by Vitality 4 Life Pty Ltd, ABN ABN: 68 090 555 641; ACN: 090 555 641 of 5/10 Brigantine Street, Byron Bay NSW 2481 ("Vitality 4 Life", "our", "us", "we", website"). undertake not to attempt to circumvent any security system used in connection with the Website. Vitality 4 Life will not be liable for any loss or damage you suffer by the use of the website or a linked website; or any breakdown or interruption to the Website. Vitality 4 Life makes no representation that the Website or its contents complies with any applicable law outside Australia. Images of goods published on the Website without an advertised price beside the image are not offered for sale. Photographs are illustrative only and may vary from the goods described or offered for sale. The Website may display the products or services of a party other than Vitality 4 Life including in the course of promotions, events and competitions ("Third Party Advertising"). No representation or warranty is made or given by Vitality 4 Life in relation to Third Party Advertising and you agree that Vitality 4 Life will not be liable to you for any loss or damage you suffer in reliance on any representation, error or omission in any Third Party Advertising. To the extent permitted by law neither Vitality 4 Life Pty Limited nor any of its nor any of its employees or any associated companies, nor any other party involve in creating producing, or delivering this site, shall be liable for any direct, incidental, consequential, indirect or punitive damages, costs, losses or liabilities whatsoever arising out of your access to, or use of, this site. Everything on this site is provided to you "AS IS" without any express or implied warranty of any kind including warranties of merchantability, title, non-infringement of intellectual property, or fitness for any particular purpose. The "Vitality 4 Life" logos are registered trade marks of Vitality 4 Life Pty Ltd.
You acknowledge that any intellectual property rights, including graphics, logos, trademarks, distinctive brand features, design, text, icons, the arrangement of them, sound recordings and all software relating to this website, are owned by Vitality 4 Life, and that these remain the property of their respective owner and must not be used in any manner without the prior written consent of the owner. These intellectual property rights are protected by Australian and international laws and nothing in these Terms gives you a right to use any of them. Nothing contained on this website is to be interpreted as a recommendation to use any information on this website in a manner which infringes the intellectual property rights of any person. Vitality 4 Life makes no representations or warranties that your use of the information on this website will not infringe such intellectual property rights. You may view this website and its contents for personal and non commercial use only and subject to the Copyright Act 1968 (Cth) and similar legislation, you may not in any form or by any means reproduce, modify, distribute, store, transmit, publish or display within another website or create derivative works from any part of this website or commercialise any information obtained from any part of this website without the prior written consent of Vitality 4 Life or, in the case of third party material, from the owner of the copyright in that material. You may not modify or copy the layout or appearance of this website nor any computer software or code contained in this website, nor may you decompile or disassemble, reverse engineer or otherwise attempt to discover or access any source code related to this website. If you correspond or otherwise communicate with Vitality 4 Life, you automatically grant to Vitality 4 Life an irrevocable, perpetual, non-exclusive, royalty-free, world-wide licence to use, copy, display and distribute the content of your communication and to prepare derivative works of the content or incorporate the content into other works in order to publish and promote such content. This may include, but is not limited to, publishing testimonials on this website and developing your ideas and suggestions for improved products. Vitality 4 Life reserves the right to prevent third parties from linking to this website. that the data you receive from Vitality 4 Life will be secure, virus free or will not damage or interfere with your computer systems. You should take steps to ensure the security of your systems when using the Website. Vitality 4 Life will not be liable to you for any loss or damage you suffer from viruses, malicious computer code or other forms of electronic interference. Please report to Vitality 4 Life any suspected interference or damage to your electronic systems arising from your use of the Website or any linked website. We will at all times, do our best to maintain correct inventory of all goods listed on our website, however at times some items may become out of stock or unavailable. Reproduction of colours is as accurate as possible, but please note colours instore may vary slightly from what is displayed on your monitor. Any advice, recommendation, information, technical information, specification, drawing, description, illustration, dimensions, assistance or service provided by Vitality 4 Life in relation to any products is given in good faith and is believed by Vitality 4 Life to be appropriate and reliable. However, any such advice, recommendation, information, technical information, specification, drawing, description, illustration, dimensions, assistance or service provided by Vitality 4 Life in relation to any products supplied by Vitality 4 Life is approximate only.The information within this site and all it's links are presented for health educational purposes only. It is not intended for diagnosing, prescribing or for the treatment of any illness. Any application of the advice herein is at the viewers discretion and sole risk. You are advised to consult your doctor or a health care professional before deciding to take part in any exercise, diet or supplementation program. If you have any medical problems please consult with your doctor or health care professional before embarking on a health, detox or exercise program. If symptoms persist or if you are pregnant or breast-feeding seek medical advice. The information on this website is provided for general health informational purposes only and is not intended as medical advice. All prices listed on www.vitality4life.com.au are in Australian Dollars and as such will be charged in Australian Dollars. All pricing is quoted for shipping throughout Australia only. All references to $ and dollars on this website are to Australian currency. Prices are subject to change at any given time and without notice. 1. When you order and purchase Merchandise from V4L, you represent that you are of legal age to purchase the Merchandise ordered and that the Merchandise can be purchased and owned in your state, county, and/or city of residence. By offering Merchandise for sale, V4L does not represent or warrant that any specific purchaser may legally purchase, own, or possess the Merchandise ordered. 2. Exercise equipment and other Vitality 4 Life Merchandise may be dangerous if used improperly or negligently. When you purchase Merchandise from V4L, you agree that you will use the purchased Merchandise in a safe and legal manner, consistent with all applicable laws, recognized safety rules, and good common sense. You further agree that you will train and supervise minors in the use of V4L Merchandise and that you will take such steps as may be reasonably necessary or required by applicable law to keep V4L Merchandise out of the hands of minors and untrained and/ or immature individuals. 3. When you purchase Merchandise from V4L, you agree to assume all risks related to and/or arising from your ownership and use of the Merchandise and agree to indemnify and hold V4L harmless from any and all claims brought by any person or entity against V4L related to and/or arising from your ownership and/or use of the Merchandise. 4. Vitality 4 Life Pty Ltd does its best to accurately represent the Merchandise, through photo, price and copy. Occasionally we make mistakes. If such a mistake should occur, please let us know and we will rectify the mistake as soon as possible. 5. 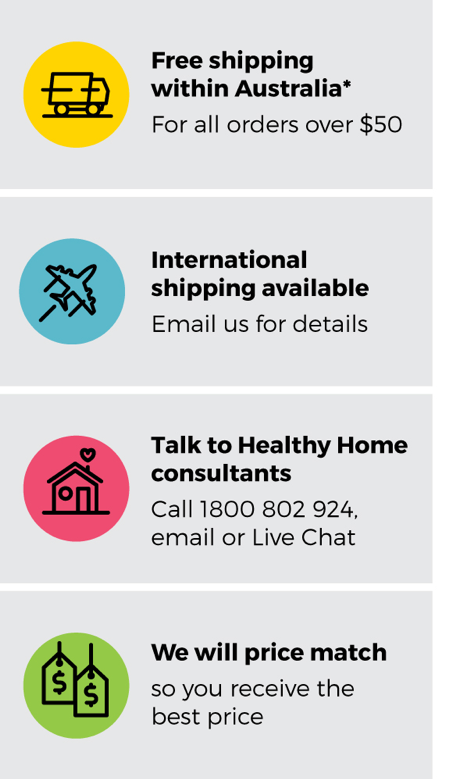 Please note that material on this website relating to wellness based products may not have been evaluated by the Australian Therapeutic Goods Administration. Any product is not intended to diagnose, heal, cure or prevent any disease or condition. If you have any medical problems please consult your family doctor. 6. Any testimonial from domestic users, or medical and alternative health professionals is case specific and there are no guarantees such results can be obtained, experienced or felt by every unique individual. Any user experience, commercial or otherwise, is case specific, and there are no guarantees such results can be seen, or achieved by every business, company or individual. If the product exhibits a defect while in normal domestic use, within the warranty period; we will, at our option, either repair or replace the juicer or defective part free of charge. The product must be delivered by insured mail, in proper packaging to your service centre as indicated on the back of the manual as a condition to any warranty service obligation. In the event that the warranty period for a product has expired, or if a product does not qualify for warranty service, repair or replacement, consumers may still buy replacement parts or have products repaired by one of Vitality 4 Life's Service Centres. Please contact Vitality 4 Life for further information. Do not send the product back to the service centre without return authorization form. 5. In no event shall our liability exceed the retail value of the product. We make no warranty on with respect to parts, from a source other than Vitality 4 Life. 6. In the event that warranty parts or products are provided, the customer must cover the related shipping costs to receive goods. 7. All exchanged or substitute parts and products replaced under warranty service will become the property of Vitality 4 Life. Repaired or replaced products or parts thereof will be warranted by Vitality 4 Life for the balance of the original warranty period. Damage, accidental or otherwise, to the product, not caused by direct defect in factory workmanship or materials. Damage caused by parts or service not authorized or performed by Vitality 4 Life. 'Normal' Wear and tear through use of the product and parts. Some states do not allow the exclusion or limitation of incidental or consequential damages. So the above limitations may not apply to you in the case of damage in shipment. If your product was damaged in shipment: Immediately report this type of damage to the parcel carrier and have them file an inspection report to contact the distributor from whom you purchased the product for further instructions. You have rights and benefits under the consumer laws in your jurisdiction. Without detracting from these rights or benefits, Vitality 4 Life excludes all liability in respect of this product for any other loss which is not reasonably foreseeable from a failure of this product, which may include liability for negligence, loss of expenditure associated with the product and loss of enjoyment. This website has been designed for use within Australia. By accessing this website you are agreeing that the Courts of New South Wales, Australia will deal with any disputes which may arise between you and us, and that the laws of New South Wales, Australia shall be the applicable law.